The Skanner News - Will the Lloyd District Superblock Development Bring Jobs to Minority Communities? Will the Lloyd District Superblock Development Bring Jobs to Minority Communities? Last month, a row of 13 White men picked up golden shovels to break ground at the Hassalo on Eighth "Superblock" construction project. The symbolic gesture publically launched a $60 million development that will turn three blocks of Lloyd District parking lots into a shiny new residential and commercial neighborhood. "This is one of those rare projects that will be transformational to the City of Portland," said Kyle Anderson, a lead designer with project architects GBD. "With careful planning we are changing the experience and perception of an undeveloped district in the heart of Portland. And we are turning this into an eco-district, demonstrating all the principles of an eco-district as the basis for our design." Hassalo on Eighth is designed to create a walkable city neighborhood with a sustainable, green footprint. At the groundbreaking, talk centered on green building features, such as living walls, and state-of-the-art water recycling. Mayor Charlie Hales credited progressive policies in transportation and planning with attracting American Assets Trust, and other investors, to Portland. "We're about placemaking," Hales said. "We're about creating quality of life at street level that makes Portland a great place to invest. And all of us in this room, regardless of our roles are committed to that quality of place." But will Portland's communities of color see any of those jobs or contracts? We'll have to wait and see. The answer is important because the three-block project is just the first in a series of large developments that American Asset Trust is planning for Portland's Eastside. The San-Diego-based developer, which also owns the First & Main tower building in downtown Portland, has bought a total of 16 blocks in the Lloyd District, bringing its investment in Portland to almost half a billion. That's according to company chairman Ernest Rady. So over the next decades, 13 more blocks could be developed, generating many, many more jobs and opportunities in the Lloyd Eco-district. If Hassalo on Eighth included public money, a percentage of those jobs and contracts would be certain to reach communities of color. For the Sellwood Bridge project, for example, Multnomah County set a goal of 20 percent participation for disadvantaged, women, minority and emerging businesses, as well as another 20 percent for apprentices in training. Those kinds of numbers are becoming standard for public projects. However, as a privately held Real Estate Investment Trust, American Assets Trust is under no legal requirement to include diversity or local hiring targets among its goals. Hales thanked the investors the and other businesses making this bold new vision for the Eastside a reality. And he also praised the work of city staff who helped make the vision a reality. "I want to call out and commend the good work the city's agencies have done in working as a partner – this is a complex project obviously. It involves people from multiple city bureaus working together on permitting, public works and co-ordination. And we will continue, you have our promise, we will continue to be a good partner for you through all the subsequent stages of this project." The city has spent more than two years working with the developers. Staffers have helped smooth the path of permitting and planning. Yet local hiring, contracting and equity have never been part of the discussions. Nevertheless, minority construction workers and contractors may benefit from the project. Turner Construction, the main contractor on the project, has some street cred when it comes to diversity. In 2010, the firm won a Corporate Diversity Firm of the Year Award from The Business Diversity Institute Inc. Turner also has consistently been named one of the best firms to work for in Oregon. Stacey Drake Edwards, diversity and compliance manager with Turner, told The Skanner News she is working with the project team to create opportunities for minority, women, and other historically disadvantaged business contractors and vendors, (known as MSWEB to insiders). "What we have is an opportunity to continue the philosophy of participation in private work," she says. "Turner is committed to building capacity and participation on all projects, so let's do it! "It may look different because we are not on a mandate. But because we truly believe in the idea of participation, building capacity and working with smaller diverse minority subs, we are moving forward to do this." Edwards says the project is just beginning to look at breaking up the work into smaller pieces – a strategy that has worked well for public projects. Through meetings with the National Association of Minority Contractors of Oregon and the Oregon Association of Minority Entrepreneurs, Edwards has been learning more about current subcontractors and vendors in the community, and their capacity to work on larger jobs. 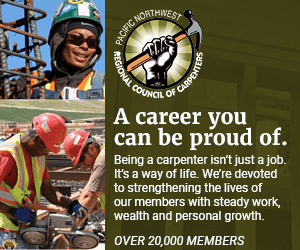 Now, as Turner starts building a competitive roster, Edwards is talking to leaders at OAME and NAMC, Oregon, about how to create long term relationships that also help build capacity in the contracting community. So far, she says, Turner has not developed any hard targets. But she maintains Turner is creating "hard opportunities". "It's not about the number; it's about the action, the opportunities created and the awards," she says. "We really want to award contracts. So at this time we don't (have hard numbers). But we are excited to really tell our story as the work really begins to hit the ground and lasting working relationships are built with the Turner project staff and the minority contracting community. " Edwards says the community will see results as the project progresses.